The guys of Ireland's Ground Of Ruin have been fairly busy since they've been together, releasing three demos and a promo single. Each release has further refined their sound as they seek not only to improve their songwriting and musicianship, but also to set themselves apart from the bevy of bands that relentlessly toil in the underground world of Heavy Metal. Cloaked In Doctrine, Ground Of Ruin's latest demo, finds the band working in the realm of Scandinavian Death/Thrash that was highly innovative in the late 1990's and early on in the new millennium. By no means, however, should the band be considered "retro" or a throwback outfit. Ground Of Ruin instead lends a modern perspective to the sound of early At The Gates and Amon Amarth, yet stops short of falling victim to the current Melodeath trend. Cloaked In Doctrine opens with a rather eerie atmospheric intro that, while not far from ordinary, works well to establish a sinister mood. The title track then bursts forth with some fairly unremarkable Black Metal, replete with blasting double-bass from Francis Moran and numbingly repetitive riffs from Rob Chanders and Dom Brennan. Soon enough, though, the band introduces their particular styling through some interesting harmonized leads as well as a number of varying tempos. Frontman Dave Hynes primarily uses a mid-range, Blackened shriek to hurl the lyrics but, as the demo progresses, he varies his delivery to incorporate a deeper, Death Metal growl as well as some higher pitched wails. "Burning The Olive Branch", my favorite song on this short album, opens with some nice harmonized leads and a strong overall melody. Chanders and Brennan spend the majority of the track embarked upon differing, yet parallel, paths that provide a lot of interesting twists, though they frequently join together for some complex riffing. On those occasions, Moran compliments his blast beats and double-bass with a bit of hi-hat, lending the track a bit of a Death 'n' Roll quality. Cloaked In Doctrine wraps up with the intense "Beneath Contempt", featuring plenty of punishingly raw buzzsaw riffs and a number of Thrashy breaks. Notice that I did not say breakdowns. Ground Of Ruin thankfully doesn't resort to watering down their sound with anything closely resembling the *core sub-genres that all the kiddies fancy. Instead, the final track features a brief atmospheric passage that leads into a very strong solo, at which point Derek Gibson's bass emerges from the depths of the mix to provide a healthy bit of groove before once again returning to lurk beneath the surface. 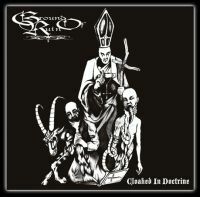 Ultimately, Ground Of Ruin still has some distance to cover before unleashing a sound that sets the genre on it's side. Nevertheless, Cloaked In Doctrine is a strong example of high quality Death/Thrash in the old Scandinavian style that will certainly appeal to genre fans. Don't miss this one.